Motorsports Village • View topic - Top Bulb Racers? Post subject: Top Bulb Racers? OK so after a couple of red lights last weekend I'm wondering how much delay is "normal"? So how much delay do you guys have in your boxes and or what's the most you've ever run before? Post subject: Re: Top Bulb Racers? I have only raced a couple of races with a box for the last couple of years but when I have the box in mine I set it anywhere from 1.005 to 1.070. It really depends a lot on how deep you stage, how your car reacts and how the track has the lights set up. When they run the doorslammers at Ohio Valley the NHRA guys set up the timers and lights. Last year at that race all the regulars were going red during the time runs and if I'm not mistaken almost everybody had to roll an extra .040 or so in their box. It's not unusual to have to change the delay from lane to lane at a lot of tracks. Nearest I can tell from multiple hits at the tree last Saturday, I'm going to need 1.088 in mine to setup for a .010 light at Natural Bridge?? I've had as much as 1.082 in it in the past but at Roxboro two weeks ago I had 1.068 in and had a couple of double "O" lights. 1.078 got me a -.010 in the third round Saturday night at The Bridge. Same as barry for us 1.040 to 1.070 with led bulbs. and she stages in real shadow.. I have been dialing in the dragster and have it at 1.145 right now. Tracks I have raced at were LED lites and staged as shallow as possible. Raced at KCIR and Pacific Jct, Ia with that setting and could .00x at either track with that. Runner up last 2 times out and one was a red in the final, probably from too deep stage. With the Camaro or Roadster it was 1.110-1.130 for LED and 1.08-1.09 for incandescent. Humm, don't know if The Bridge is LED or not? Don't remember having that much of a problem there in the past as at one point a year or so ago I was double "O" 9 out of 12 hits over a couple of weeks. Have to check into that this weekend as I'm going back there Saturday. 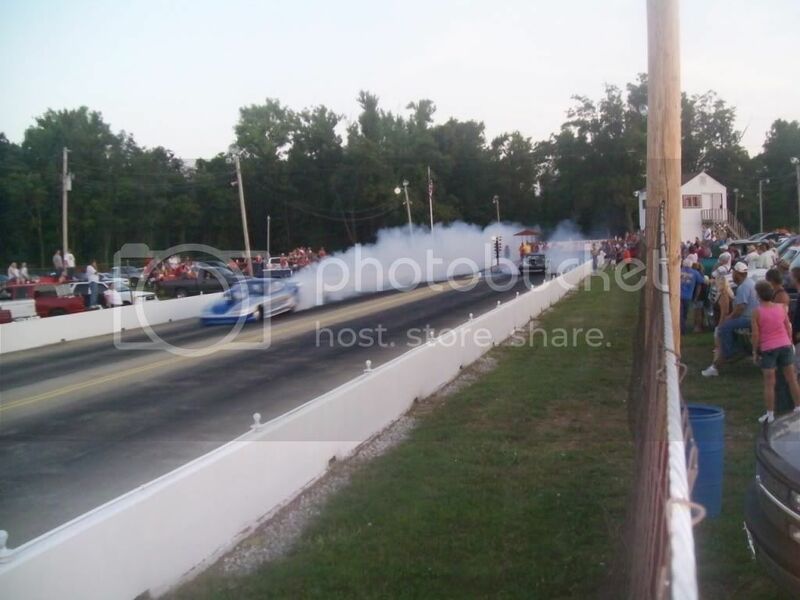 Last week second round ran a 5.469 on the brakes on a 5.47 dial for the loss. No, I don't know where that one came from? Bought back and went -.010 red same lane third round running another .46. I guess sometimes you're just off. These new stiff sidewall tires must be what's causing the car to react so fast. Last set weren't S sidewalls. I usually run 1.055 - 1.065 in the vega with 60 fts of 1.32 - 1.34 The stiff sidewall M/T's require .006 - .008 more delay on my car over the regular sidewall tires. 1 thing every racer should do, is figure out what delay # would have been a perfect light, after a couple visits to any track you'll know exactly how much delay you should be running. Do I set delay for a perfect reaction? NO, but not far away, which is the reason i've had a ton of -.001 and -.002 lights. Yeah Mark, I usually setup for an .010 just to allow for the jitters and it usually works OK. Just got to get my concentration back I guess. We were going to race yesterday but they has some bull s**t imitation "pinks" s**t there and I'm just not into that period so we passed. Went satellite dish hunting instead and scored!! That and I had to pull the intake off and reseal it as the methanol finally got to the RTV I was using in place of a gasket. We're good for this coming weekend though and hopefully the FOFG can get back on the tree for a change!! Oh, and the 1.078 delay netted me a -.010, which means that I might need .020 more to have a .010. Never ever seen anyone run THAT much delay? A couple of time runs will tell that tale though. Last weekend at the bracket finals at US60 I had the box back in the car. I hadn't used it all year but by the time I got to 2nd round of Sunday's race I had 1.080 in it and came up -.004. I had rolled another .010 in it for 3rd round but must have bumped the switch before I pre-staged. By the time I staged the box was timed out and not knowing it when I moved my foot off the clutch I jumped through the lights. I have a switch mounted on my shifter that I release with my index finger. I did find my RT changed significantly depending on what pert of my finger I held the switch with. So you might try to pay attention to how you hold the button for consistency. I have delay box raced several times. The biggest thing to do is not worry what delay others are running. I have run as little as .950 and as much as .990 in my 11.00 door car and in my dragster as much as 1.180 and little as 1.100 depending on myself, track and conditions. How I set myself up is to pick a spot on the box. With the door car this year I put .980 in the box for the start. Went up staged as shallow as possible and hit the top bulb in a nice comfortable spot on the flash. (I wasnt anticipating). Came up .025, went up for second pass no changes .024. That was what I wanted two consistent hits. Pulled out .017 from the box for a setting of .963. Went up first round clean hit .006, second round .004, third round .005, fourth round .008 for the L. I was .008 running .002 under, my opponent was .010 on with an 8. My point is you and your car will have a spot each and every race day you come to the track. If you come out with the delay from the previous week where you were hitting the .010 spot and you come up .020 in time runs dont be scared to roll out the .010 to get you back. Something changed with you or the car or the track between weekends. The biggest problem I see with some of my buddies is they get stuck on the 'perfect light delay' being x and they will not adjust the number below that. They will try and hit the bulb harder. This takes the advantage away from using the delay box. The advantage to the delay box is the adjustability. As the driver we must stage the car the same (same place side to side, and how deep we are in the lights), hold the button the same in a comfortable position, and release at the same time. If we do this the number in the box is an arbitrary value we adjust to get us to the .010 spot we are looking for. My numbers are going to be no good to you Ken, we have .400 tree. If I run full tree I usually have .780 to .790, and when I run S/G I have between .005 & .015.